Who’s in the lead in the Golden Sombrero standings after seven events? None other than Redlands TD and co-GS Instigator Bill Maury-Holmes! Bill’s 163 points after playing in four events give him a ten point lead over multi-time GS Champ A.J. Risley. But A.J. will not be playing any more Golden Sombrero events this season, as he will be playing at the Gentleman’s Club Challenge in Las Vegas and the Memorial in Scottsdale. Mark Verrochi could mount a late charge with three events remaining, as he has only played three events so far and is third in the points at 125. Cory Marstellar is two behind Mark at 123 to round out the top four. But really, there are a whole bunch of disc golfers who still have a shot at this year’s title. That’s because the three remaining events: Wrightwood, Mission Bay and Colina Park could all have large fields, which means big points. Mission Bay in particular has a history of fielding close to 100 players, so Bill better watch his back! Wrightwood may also draw a big crowd after players hear the news that all 27 holes will be available for play (barring a huge snowstorm between now and next Saturday). Remember – your top four point totals count in the standings. Full Golden Sombrero standings after six events can be found here. Our thanks to Jon Ho for this story! Many thanks go out to Suzette Simons for doing such an amazing job TDing the Sky High Showdown and keeping everyone safe, especially under such tough conditions!! Saturday, while being a little windy and overcast, went off without a hitch. Sunday, however, rained throughout the Pro round in the morning and the threat of a lightning storm loomed. The Pros finished up fine, though, thankfully. But during the Am round later in the day, it really began to pour. Suzette kept checking in the Mt. Lodge Staff to make sure that everyone would be safe, but when the lightning started to come in fast and heavy, she had to call everyone in. With nearly 100 people all stacked in the lodge, Suzette did her best to keep hope alive and keep all the Ams happy while we all waited to see if they could be sent back out to finish the round. Unfortunately, after about an hour in the lodge, Sky High staff recommended that the tourney be called off, so Suzette had to make the announcement, much to everyone’s dismay. There were some great folks that jumped up and volunteered to get the raffle going while Suzette worked furiously to make sense of the numbers, saw what holes everyone in each division had played and could be counted in the final scores for the day. It was huge mess, but Suzette really pulled it all together in an amazing way!! Big thanks also to all the gents that volunteered to run the raffle: Danny Behl, Jeremy Fairchild, Keith R. Wilson, and Jeff Nyerges!! And huge thanks to all the great folks that stuck around to help clean up the lodge: Mike Jewel, Tiara Cargile, Jeff Nyerges, and Chris Mattox!! I don’t think Suzette was able to head down the mountain until after 8:30pm, and that wouldn’t even been possible without the help of you great folks!! Thanks again to everyone (who helped), and apologies to anyone whose name I’ve missed here!! 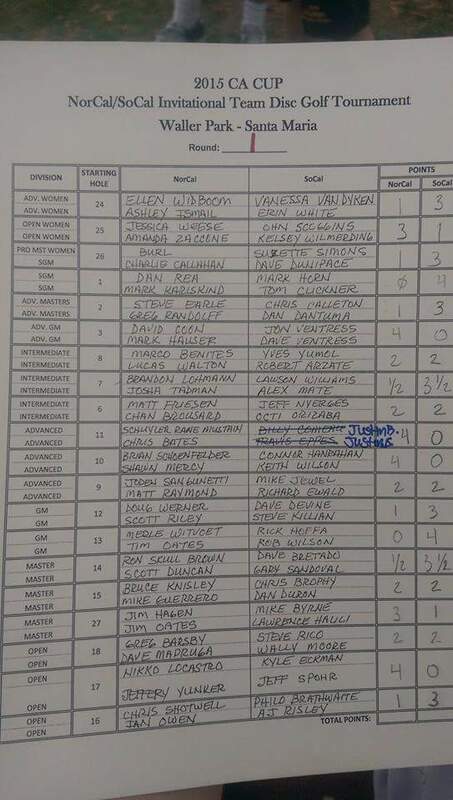 Results on PDGA.com for the Pro divisions. 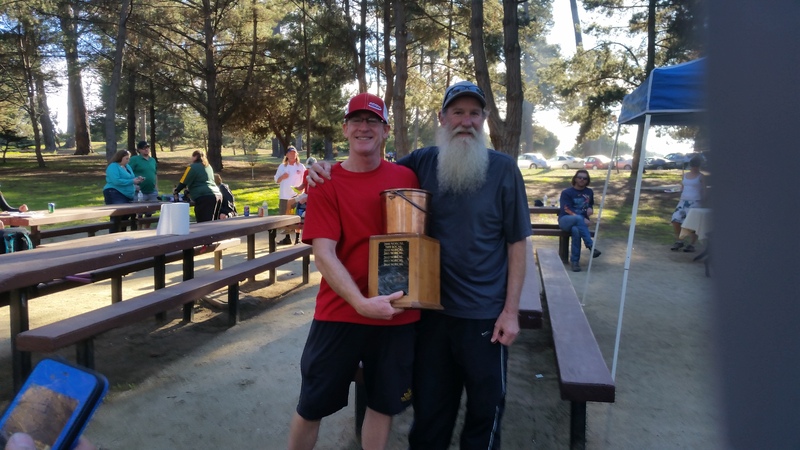 At the SoCal member meeting held back in December at Prado Regional Park, many members expressed that they would like to see the SoCal Championships rotate to different locations. You asked for it, you got it! The 2014 SoCal Championships will be held November 8-9 (Ams) and November 15-16 (Pros) at Hart Park in Bakersfield, using both the mountain and flats courses. Rocky Brown is merging his popular Sharktooth Open tournament with the SoCal Championships, sharing the TD duties with SoCal President Randy Wylot. Registration will be available soon on DGU and a flyer is available for download here. The plan for future years is to rotate the championship tournaments between different locations in SoCal, such as Santa Maria, Lake Casitas, La Mirada and north San Diego. Doing this will require the assistance of TDs and volunteers at these locations, so be ready to help when the SoCal Championships are in your backyard! Disc Golf in Pasadena Senior Games! The event is on Saturday, June 21 beginning at 8am. You can find details on this flyer. Many thanks to Mark and Susie for hosting this event! 2014 Ice Bowl Season is Here! The 2014 Ice Bowl season has begun and the Golden Sombrero Series is back for another year. If you don’t already know, Ice Bowls are charity fund-raising tournaments held each January and February to benefit local food banks. For over 25 years the Ice Bowl movement has been bringing disc golfers out in the cold to help the hungry – this year there are over 200 events scheduled across the country. Find more info here: icebowlhq.org. 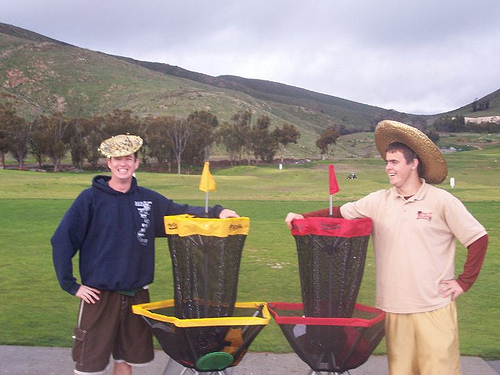 While we don’t get a lot of ice and snow in Southern California, we still like to play disc golf and help the hungry, so we participate in the Ice Bowl fun. Cliff Towne has been running the Ice Bowl in Paradise at various locations for over 10 years and six years ago, Bill Maury-Holmes created the Golden Sombrero Series – a collection of Ice Bowls in SoCal. Since there were four events that first year he came up with the name “Golden Sombrero”, which is a term used to describe going 0-4 with four strikeouts in a baseball game. He and Allen Risley have coordinated the GS series ever since, and this year is the biggest it’s been. And this will be the third year with actual ice at a GS Ice Bowl, since the series returns to Wrightwood on Feb 22. 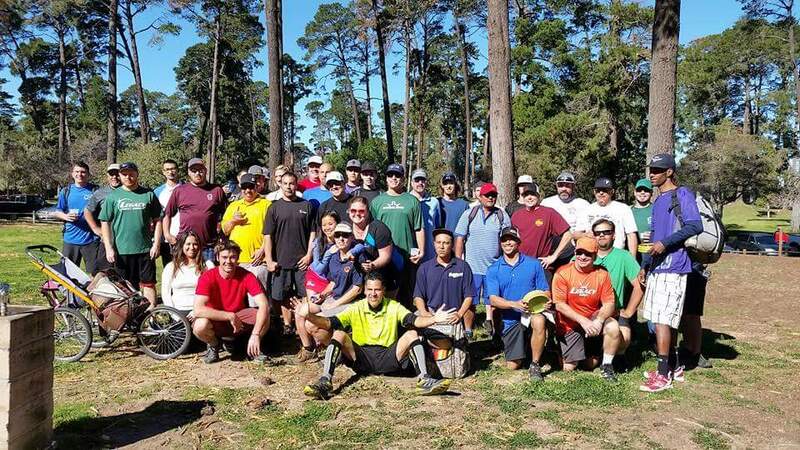 The first event of the season was held last Saturday (1/4) in Redlands, where 55 players showed up at Ford Park to ring in the new disc golf year. After 18 holes of golf, Danny Zwolenski and Kerry Miller were tied at 19-under par, with the help of a few mulligans. Danny’s CTP tie-breaker shot was a bit closer, so he walked away with the trophy. That puts Danny in the lead for the Golden Sombrero Series title, which awards the winner a gold-painted sombrero and a portable basket. Points are awarded at each event for the number of players you beat, with your top four point totals counting towards the title. Mulligans you ask? Yes, many of our Ice Bowls sell mulligans for $1 each to raise funds for their charity. And all of them have some type of prize raffle to raise money as well. Don’t expect a big prize payout since the point of these events is to feed the hungry. But you can expect a cool (no pun intended) custom-stamped disc and a chance to play a fun round with friends. If you’ve never played a tournament before, an Ice Bowl is a great, low-stress way to get started.